In just eight months, the "puppy" grew 1.7 metres tall and weighed 80 kilos. In 2015, a Chinese man found a small, abandoned puppy in a mountain trench in southwest China's Yunnan province. Seeing the helpless pup roam around alone, he brought it home. He fed the puppy milk, corn and sausages. Mobile videos, presumably shot by the owner himself, show the unusual-looking black puppy wearing a leash, playing around in the front yard with another dog. Video also shows the puppy comfortably walking on its two hind feet, a remarkable feat for a canine. Well, that's because the puppy was actually a black bear. The man says he didn't know. To be honest, we think the "puppy" looked like a bear all along. But the owner claims he was surprised to see the "puppy" grow up to be 1.7 metres tall and 80 kilograms heavy in just eight months which is when he finally realised it wasn't a puppy he was raising. 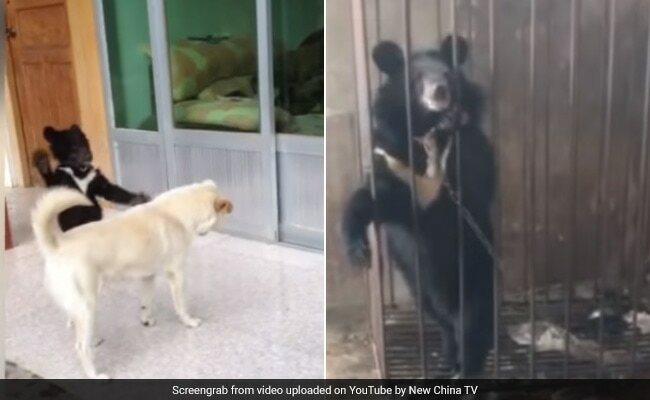 For people's safety, he chained the black bear and put it inside a cage. The bear continued to live chained up inside a cage till local forest department officials discovered the animal in February. Authorities informed the man it was illegal to keep the black bear as it was a protected species. The bear was moved to a animal rescue and breeding centre in Yunnan's Lijiang city.